The same McClatchy team that has long been chasing the Steele dossier allegation that Michael Cohen was in Prague in (the first two reports said) August or maybe (the last report said) September has a new story reporting two new details about the allegation, sourced to four people reporting anonymously and secondhand about what “foreign intelligence connections” told them. I’ll get to the substance of the report in a second, but first I want to point to a claim they make. It’s a remarkable claim from reporters trying to cover a part of the Russian investigation (but who have covered very little aside from the Cohen in Prague allegation). Because no, the big questions are not and have not been for some time whether Cohen told investigators of this. Weirdly, the reporters writing up this story show no awareness of whether Mueller has obtained Cohen’s records. Cohen is likely to be one of the five people who had the information from their AT&T phones (or a likely comparable number who probably had information their Verizon phones) obtained back on March 9 in the wake of the Rick Gates plea. In any case, we know that the FBI seized a whole slew of Cohen’s phones on April 9 and were able to fully exploit all of them save an old Blackberry. So we don’t have to rely on extrapolating from what are often common first steps, because we know that Mueller has already obtained Cohen’s actual phones (to say nothing of his phone records). Cohen provided the SCO with useful information concerning certain discrete Russia-related matters core to its investigation that he obtained by virtue of his regular contact with Company executives during the campaign. That’s the one description of Cohen’s cooperation that might incorporate covering up for Manafort in August or maybe September 2016. Perhaps a Prague meeting is included in that bullet — as I noted in April, Cohen’s then lawyer avoided addressing the issue (though Lanny Davis, working as a flack yet being employed as a lawyer, claimed repeatedly after April that Cohen had not been in Prague). If it was, however, Mueller nevertheless chose to focus on Cohen’s lies about a Trump Tower deal in Cohen’s allocution. The defendant lied to Congress about a business project (the “Moscow Project”) that he worked on during the 2016 presidential campaign, while he served as Executive Vice President at a Manhattan-based real estate company (the “Company”) and as Special Counsel to the owner of the Company (“Individual 1”). 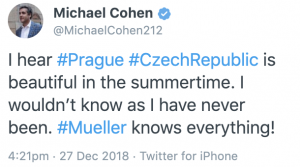 Nor was a Prague meeting described to be among the things that Cohen lied about at his first proffer session so as to avoid conflicting with lies he told Congress (and if Cohen did go to Prague, he would have lied to Congress about that). This initial meeting with the SCO, on August 7, 2018, was set up at Cohen’s request. In that meeting, Cohen voluntarily provided information relevant to other aspects of the SCO’s ongoing investigation, but when asked questions about the Moscow Project, Cohen provided false answers in what he later explained was an effort not to contradict his congressional testimony. And Mueller didn’t include Cohen’s claims about Prague in a footnote describing Cohen’s other lies about contacts with Russians. The defendant, without prompting by the SCO, also corrected other false and misleading statements that he had made concerning his outreach to and contacts with Russian officials during the course of the campaign. For example, in a radio interview in September 2015, the defendant suggested that Individual 1 meet with the President of Russia in New York City during his visit for the United Nations General Assembly. When asked previously about these events, the defendant claimed his public comments had been spontaneous and had not been discussed within the campaign or the Company. During his proffer sessions, the defendant admitted that this account was false and that he had in fact conferred with Individual 1 about contacting the Russian government before reaching out to gauge Russia’s interest in such a meeting. The meeting ultimately did not take place. None of that rules out the McClatchy report that Cohen was in Prague. 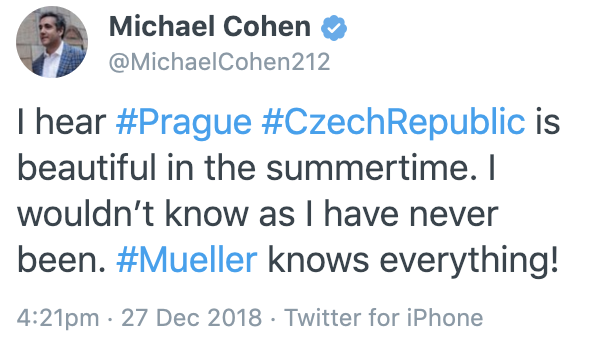 If Cohen was in Prague, Mueller might well want to keep that secret. But thus far, Mueller seems to think that Cohen’s role in brokering a Trump Tower deal (including, per BuzzFeed’s reporting, with a banker tied to GRU, the intelligence agency that carried out the election year operation) was a more important lie than anything that got reported in the Steele dossier. All of which is to say that I still stand by this post, in which I argue that it’s high time for reporters to stop focusing primarily on whether details of the Steele dossier have proven true (particularly if that’s all you do on the Russian investigation, as it substantially is with these reporters), and instead look to laying out the implications of the conspiracy that Mueller has already provided corroboration of. There is growing evidence that Trump conspired with Russians in 2016. That evidence, however, comes increasingly from Mueller, not from Christopher Steele.